This is a really old webpage. I no longer use web editing software that edits these pages. I run several other websites with different software. This sighting happened just like I describe therefore the page is still here for my visitors. Perhaps one day I will build a new page using the new software. I would like to add video and interviews with witnesses if possible but I live about an 8 hour drive from Pearl now. 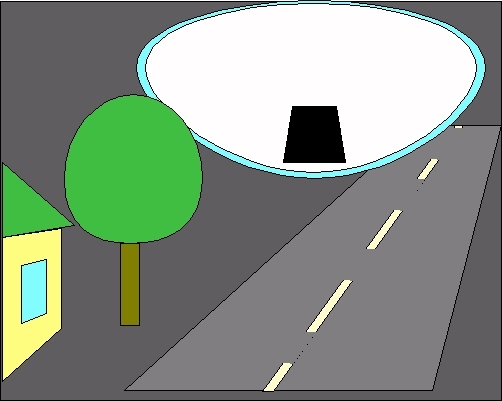 Here you see a drawing I made of my close encounter with a UFO back around 1970 in a small town called Pearl, IL. We were standing at the lower right side of this picture along side of the highway. Looking up at the disk shaped object made it appear to be deeper on the bottom. Naturally we could not see the top of the craft clearly. There was no indications of seams, welds or rivets anywhere on the craft. Read My Story below. UFO Update This page deals with UFO & Paranormal related subjects. My thoughts and findings on such things. May also have links to other sites with information and TV programs on the subjects. Bill Pitts was on the Sightings Radio program Monday 12-1-1997 Go listen to the show in the real player archives. When I was a lad in my home town, the local boys would sometimes stay up late at night doing things that boys do and frequently we would see a bright white object come out of the North, down the Illinois river. It would come up to the old railroad bridge, fly up over it, then turn West, fly up and hover sometimes for 5 or 10 min over the power lines over the old mine hill. Then it would cross over to the South West over Old Pearl and turn and vanish off to the South. Sometimes we would chase after the bright object in our cars and sometimes we knew we had to be close but the thing would just vanish. I recall one time I was in the parking lot near the fish market right beside the rail road bridge when I saw the object come down the river, up over the bridge then turn and go up over the power lines over the mine hill not more than a mile from where we were standing. Then when I was about 17 years old a friend and I had been roller skating in a city about 20 miles away and when we returned home around 11:30-12 midnight we saw the bright white object hovering over the power lines. I told my friend to pull over on the side of the road and we would watch the object expecting it to cross over to the South and vanish as it always did. This time however something different took place. As we were standing in front of the car the object appeared to become larger until I finally realized it was not growing larger but it was coming directly toward us. The object moved to a position only a few yards in front of us and hovered there without making a sound. It was bright white with a silver blue halo and had a dark black area facing directly toward us. The object was very bright to look at and I kept thinking, "What's wrong with this picture?" while I was saying, "Isn't it beautiful." I was wishing if only I had a camera, but couldn't get it out of my mind how unreal this real object appeared to me. Certainly it wasn't swamp gas, certainly it was a controlled craft of some kind but it was defying my senses to describe just what it was about this thing that caused me to have the feeling that what I was looking at couldn't be real, yet there it was, as big as life. Finally car headlights came up behind us and turned off on a road about 100 yards behind us. The object slowly rose from where it was and moved up and over the hill to the South and out of sight. I wanted to go after it but my friend said we were nearly out of gas so he took me home. When we got there we heard my father and sister describing this bright object they had seen going over the hill. I learned the vehicle that had come up behind us was my father and sister who had been to the farm to feed the horses. They had also seen the object. Then my friend and I told our story about how we had been standing only a few yards from the object as it had hovered over the highway in front of us. That night I pondered on what it was that made the object appear so strange, then it occurred to me. First of all, this object defied my senses in that it flew and hovered without making any sounds, yet it wasn't a balloon as it had flown against the wind and could hover in a rock solid hover wherever it stopped. Second, the object was bright to look at, bright enough that it should have lit up the entire town but it didn't and this was not natural. At that time I didn't understand how this craft could accomplish these things but the close up sighting of this object stirred my interests until I have been on a quest for answers all these many years. I believe that I may have found some explanations for how this craft was able to do these things and I will share these thoughts with you. I try to keep up with the popular programs that deal with the subject of UFO's and paranormal phenomena but I recently bought a video tape called the "Lazar Tape". The Lazar Tape is produced by Robert Lazar who says he worked for the Government on above top secret flying saucer project at area S-4 South of Area 51 in the Groom Lake area of Nevada. In this tape, Robert Lazar describes the propulsion system inside one of these craft. He tells how it works and why it doesn't make any sounds that could be detected by the human ear. He also tells why the object could be bright to look at but would not light up the entire sky. He tells how these objects can literally vanish from view. These explanations could be the answers that I have been searching for all these years. I had considered these possibilities but until I viewed this video tape I had no real explanations that I would consider possible. No other except the thought this object was not built by humans. Lazar describes the craft that he worked on as being propelled by a matter/anti-matter reactor. Outside of the craft you would not be able to hear the sound of the power generator that propels the craft. He also describes the craft as being lifted and propelled by gravity waves, also that make no sound. The properties of this gravity wave allow the craft to be supported on waves of gravity that literally repel the craft from the earth, warp space around the craft and cause the craft to move at speeds far in excess of supersonic speeds without making a sonic boom. These same gravity waves also bend light, holding the light that is generated by the gravity waves charging the hull of the craft, back to the craft. Only the fastest photons could escape the gravity around the vehicle. This could explain why the craft was bright to look at but didn't light up the entire town. From this I have concluded the craft that my friend and I saw may very well have been propelled by the technology described by Robert Lazar. I highly recommend his video tape for the serious UFO buff. Since my own close encounter I have interviewed witnesses and investigated a number of UFO sightings. Sometimes I work with Mr. William Pitts who heads up the New Project Blue Book based in Fort Smith, AR. Sometimes I go on investigations with him and sometimes I gather information for him. The quest for the truth is never ending. From my experiences I have determined that something other than a balloon crashed near Roswell on July 4th 1947 and the Government has been covering up the truth of this event since that time. The U.S. Government has many secrets and it almost appears as though the people they want to keep from knowing the truth are their own people. The citizens who foot the bills for their black projects. To put it simply if you want to know what the U.S. Government is doing behind your backs ask the Russians. I saw a Russian photo taken of area 51 that shows a black triangular (very dart shaped) aircraft at the end of the long runway there at Area 51. The black aircraft fits the description of Project Aurora, also known as "The Thunderdart" that our government will not admit exists. We recall they didn't admit the U-2 or the SR-71 existed for many years, but later we learned about them. When the SR-71 project was closed down in 1989 the US government told us that no other project would be put in place to replace the aging SR-71's. Naturally they have their secrets, but I have reason to believe that once again they have lied to us. The Russians know about Project Aurora, so do the British. So who is the U.S. Government keeping the secrets from ? The only answer left is the citizens of the United States of America. If they lie to us about these things perhaps they did recover an alien space craft at Roswell. Perhaps Bob Lazar is telling the truth, perhaps our government does have captured alien space craft hidden at Area S-4 at Papoose Lake South of Area 51. Later on I hope to have some reports, perhaps some photos and a few interviews posted at this site. Bill Pitts was recently featured on the sightings radio program. He talked and answered people's questions for 2 hours. You can listen to this in a real player audio archive on the Sightings radio web site. Use the link at the bottom of the page. To read more about the New Project Blue Book click on the "Blue Book" graphic. The new web site will contain information how to contact Bill Pitts directly and eventually will contain an interview with Bill concerning some of his most interesting UFO investigations. If we are lucky it will also contain some photographs. In the event you have a UFO sighting to report you may report to me as listed above with E-mail or at the address listed and/or you may contact Bill at the New Project Blue Book at 501-484-7512. I have certainly seen and been involved in some strange things during my short life of 45 years. I have learned several things in my travels that I would like to share with you here. The UFO community and indeed the world is full of people who want someone to tell them the things they want to hear. Some of them hope the truth will be what they want to believe in but when the truth turns out to be something other than what they want to hear so many of them will turn their backs and walk away. What do they do ? They travel around until they find someone, another group of people like themselves who will tell them the things they want to hear, even if it isn’t the truth. They are happy then, content and will continue to spread the news the way they want to believe it. This is America anyway and they have the right to believe what they want to believe, and to choose the religion of their choice. So many of these people have never had a close up encounter with a UFO, or alien beings and for them who want so badly to believe certain things any news or bearer of news that threatens the foundations of what they wish to believe becomes the enemy. Having experienced a close encounter with a UFO, and having many other fairly close sightings I am here to say they do exist and they existed back before any government of the world had access to such technology in a form they could have made use of it. So if you want to believe in them I am here to say first hand, they do exist. In my past research I have found other clues and evidence to indicate they have been here for a very long time. Even the Bible bears witness to beings who were called "The Watchers" and "Son’s of God" who were on the earth at that time who took to wife the daughters of men and had children by them. The children of these beings were great men who wrecked havoc on the earth and who brought down the wrath of God to bring about the flood of Noah to wipe them out. If these "sons of god" were followers of God’s will close enough to have been called Sons of God then why did they go against God’s will to take to wife the daughters of men ? If they were human men they why did God even care that they took themselves wives of human men ? Why was there a difference in the terms that described them as being different than humans ? Why did the writings say these "sons of God were on the earth at that time" as if these beings didn't come from earth but actually belonged somewhere else ? Why did it separate that particular time as being different than other times ? Where there no human men on earth at that time who could be called "sons of God" ? The term Nephlem was also used to describe these giant men, not humans simply because human terms did not describe these beings. There is also the argument they were the "Great Men of Renown" which describes two things. They were either well known or they were giants. There is a group of people who believe the word does not describe giants but rather these men were well known for fighting and killing people. As such they had a great reputation. I for one am here to say that I believe these great men were both, giants and also had a reputation for winning great battles. In an effort to find the truth I did some research believing that Goliath was more than just a man with a glandular problem. He was about 10 feet tall, he was a soldier of the Philistine army and was without question the most devastating and intimidating force the Philistine army had at their disposal. This man wasn't sick, he was big, powerful and an experienced fighter. I thought that if there was one there may have been more so I went to the library, dug out books on archeology in the area of Saudi Arabia and guess what. I found several references to skeletons that were found in the area around Jericho that were 9 to 11 feet tall. As the Israelite spies came back and reported to Joshua, they are "giants in the land" "we are like grasshoppers to them." Once again we find certain efforts to eliminate a certain race of people from the earth and here the children of Israel being directed by God to wipe out Jericho. Could this have been for the same reasons that God brought about the Great Flood of Noah ? To get rid of the half breed "aliens" who had disturbed God’s plan on earth ? While these questions all require certain evidence to help answer them there are other things I would like to share with you. The people who frequent the UFO/alien research field may not be as credible as we would like them to be. Recently I encountered a man who fits my description of one seriously disturbed individual who passed along several pictures to me of so called alien beings. This man claimed to have worked for years with the military and I do not dispute this. Then he said he worked for several more years at the infamous Area 51 where he was involved in flying disk and alien technology. He went on to tell me that he was one of the front men who was on the UFO crash clean up team and that he had in fact taken many pictures of real alien craft and alien beings. As a serious UFO investigator I try to test, check and double check the information that witnesses give me and that’s what I did in this case. When the man told me that he had flown a F-51 (late model P-51) during WW II and said the aircraft had a German engine in it, the red flags went up as to this man’s credibility. Being a pilot myself I know that unlike people who drive cars, pilots usually are aware of who made the engine in their airplanes. I was aware that P-51’s had engines made by Rolls Royce and Allison, British companies. I was also aware that we were in a war with Germany at that time and it would be highly unlikely for us to be getting parts from Germany to support our war machine. Regardless of the incorrect statement by this man I gave him the benefit of that doubt but since the red flags had all ready gone up I decided there was a good possibility that other information he had given me was also incorrect, so I set out to find out. He gave me a picture of an Orange colored "alien" which he told me was still alive but unconscious after the crash of its flying saucer. The figure in the picture was certainly realistic looking enough, or well done I should say, but there were parts of the picture that caught my attention. For one there were certain things in the picture that were not real clear, like the space suit and the metal behind the figure. I asked the man in a message if the bright metal behind the figure was in fact part of the space ship and he said that it was. I then went to the library and started sorting though UFO related books. I found the same photo of the orange "alien" in full detail in one of the books. I brought the book home, scanned the image which was clear and unblured which indicated the photo the man had given me had been doctored in an effort to eliminate obvious clues. The article in the book said this photo had literally been passed around the world by people telling other people it was a real alien being. When I saw the photo I scanned it in high res. and blew it up on my computer screen and zoomed in to see what I could learn. I learned the space suit was nothing more than a SCUBA diver’s wet suit painted silver. The zipper could clearly be seen. The seams where the suit had been glued together were also clear. Me being a SCUBA diver myself, it was not hard for me to recognize these things. The metal in the back ground that the man had told me was part of the space ship was nothing more than the display case the "wax" (yes wax) figure was laying in. The figure of the wax alien resides in a museum in Montreal Canada. Another picture that you see frequently, and I must admit was a darn good one because it had me fooled for awhile is one of a figure used in one of Paul David’s films "Roswell" The photo was donated to the Roswell UFO museum, but it was so good that it has been passed around the world as being a real "life" dead alien being. It is not, it is a prop for a movie that was made about Roswell. If you go to the UFO Museum in Roswell, NM you will find it in a large display case on the North side of the room. I have been there and shot video of it so I know this to be a fact. I’m not sure why the man lied to me about these things but he has a good sized following of people who evidently do not do their research correctly. Some of them literally worship the ground this man walks on because they want to believe him so badly. I wanted to believe him to, but I want to know the truth even more and that is why I do my best to test everything. This man also told me that a man named Branton had taken the film of the Alien Autopsy that has been shown on TV and can be bought at certain stores that sell video’s. In fact Best Buy was giving them away last weekend. I later ran into Branton in E-Mail and believe me he is not the man who shot that film. Another man however has released a video tape of an interview with another man who says he in fact was the camera man who shot the alien autopsy film. The film was aired in Japan and the face of the man was not concealed. The man said he was sorry he had ever sold the film and if he had it to do over again that he wouldn’t do it. The reason he did sell it was that he needed the money. Credible news about these things can be acquired from CNI news on the internet. (Please note, CNI news is no longer in business.) My friend Michael Paul Lindeman, former director and founder of CNI news has traveled the world doing UFO investigations. He is now a published author and can be contacted at chancellorpublishing.com. He's writing fictional futuristic novels now. I must admit he may have found his calling because he is a very good author. You can read more about his novel at my http://www.dream-link.org/novels.htm and you can use the link on that page to get to his website. To sum this all up I am inclined to believe there are many more people out there who simply want someone to tell them what they want to hear than there are people who really want to know the truth about UFO’s and aliens. Yes there are a few of us working to find the truth and I also believe there are people who have been contacted by these beings. People who have pieces of the puzzles. Ask yourself if you were one of these people what would you do with the knowledge you may have been given ? Would you be able to come right out and tell the world what you knew ? I seriously doubt it. So if you couldn't come right out and tell people what you had been given then what would you do? How would you get the message across to people ? No doubt our own government has some of the answers to these questions but they aren't willing to talk about it either. Bill Pitts of the New Project Blue Book was on the show Monday 12-1-1997. You can listen to the archives of this program on audiolink. Click on the Sightings button, click on the audio files and go to the archive that corresponds to the date. Bill comes on about half way through the program and talks about his experiences and the N.P.B.B. Thanks for visiting our web site and please check in often to see what new things have been added.